In grade 13 "Hamlet" was selected as our drama choice in English class. As we had provincial exams that year it was important to really study it. Shakespeare was a core author, but many students found him boring with all that old English dialect and obscure references. Forced to understand a little better so my marks would help get me to university I learned a lot about Hamlet. Shakespeare didn't just write for the rich, educated elite, but also for the "peanut gallery." Although you might appreciate him better if you understood some archaic bit of history, you would also need to understand the coarse vernacular of his day. Modern and even educated humanity largely ignores Shakespeare these days not realizing he is just beneath the surface. IMDB had 1,038 entities for William Shakespeare as a writer with many of the films altered for modern tastes. Wayne and Shuster had one little comedy routine where they suggested if men wanted to romance women they should "brush up on Shakespeare." Shakespeare quotations offer witty bits of wisdom. 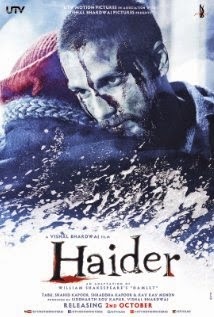 From medieval Denmark "Haider" shifts the scenery to Kashmir and from royalty to terrorist politics. Much of the plot I had forgotten, but it is fairly close to the original. The key is really the emotional tensions and that is pretty loyal to Shakespeare. The idea of making Shakespeare contemporary to make him more understandable is well illustrated here if you realize Kashmir is indeed a tense place and the politics affects everyone. Vishal Bhardwaj wrote the screenplays produced directed and even wrote the music for two other films based on Shakespeare: "Omkara" and "MacBool." There is a respect for Shakespeare in India that no doubt can be traced to colonialism. Among the cast Shahid Kapoor, (best male actor) Tabu, (best supporting actress), Kay Kay Menon (best supporting male actor), won the recent Filmfare awards recognized as the oldest and most prominent of the Indian film industry. Also won award for costume. Irrfan Khan, Shradra Kapoor ably supported the winners. Although Bollywood is prudish compared to Western cinema it is actually more explicit in the relationship. Haider and Arshia have an on again, off again relationship. In high school I had read that when Hamlet tells Ophelia to "get thee to a nunnery" he was referring to a brothel. "Haider" has an interesting take on the graveyard scene. The anguish of Haider's mother plays out with a terrorist suicide vest. To give me some perspective I also watched the BBC 2009 version with David Tennant and Patrick Stewart. It too was modernized a bit with heavy emphasis on surveillance cameras. The Bollywood version does give a little different perspective, but you will recognize the story and the tension. Shakespeare lives on.